Foreign language students from North Lamar High School who competed at the NET-OLÉ contest, beginning front row left, are Jimela Arambula Tarango, Armani Davis, Aleeza Lee, Paulo Venegas, and Vivi Van Deaver; second row, NLHS Spanish instructor William St. John, Spencer Murray, Sophie Carl, Folten Bolyard, Elizabeth Barnes, Lesly Sigala Garcia, Camri Caldwell, and Jorge Gonzales Bustillos, and back row, William Carr, Matthew Vukcevich, James Tran, Jonathan Greenwell, Madison Winter, and Cameron McMaster. 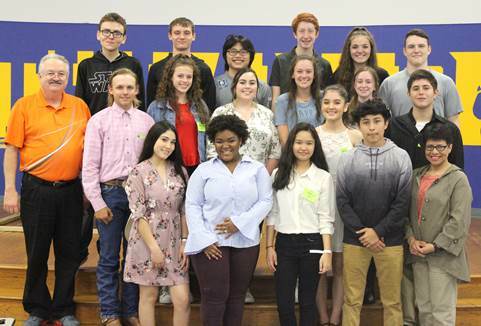 Foreign language students from North Lamar High School competed in the NET-OLÉ foreign language competition at Texas A&M Commerce on May 3. Students placing in the intermediate level were Madison Winter, who placed sixth in Memorized Poetry and Sophie Carl who placed third in Sight-reading. In the advanced level, William Carr placed third in Spelling. In the Bilingual A Verbal Fluency category, Paulo Venegas placed fourth. Jorge Gonzales Bustillos placed second in Bilingual B Verbal Fluency and fourth in the Vocal Solo Popular category. Placing third in the Dance Duet Regional category was Cameron McMasters and Lesly Sigala Garcia. NET-OLE, the North East Texas Organization of Language Educators, was established in the mid-1970’s by a group of dedicated foreign language teachers who wanted to provide their students with the opportunity to demonstrate their acquired language skills in a foreign language competition.